This past weekend was our annual Inking Idaho on the Road event in Boise. 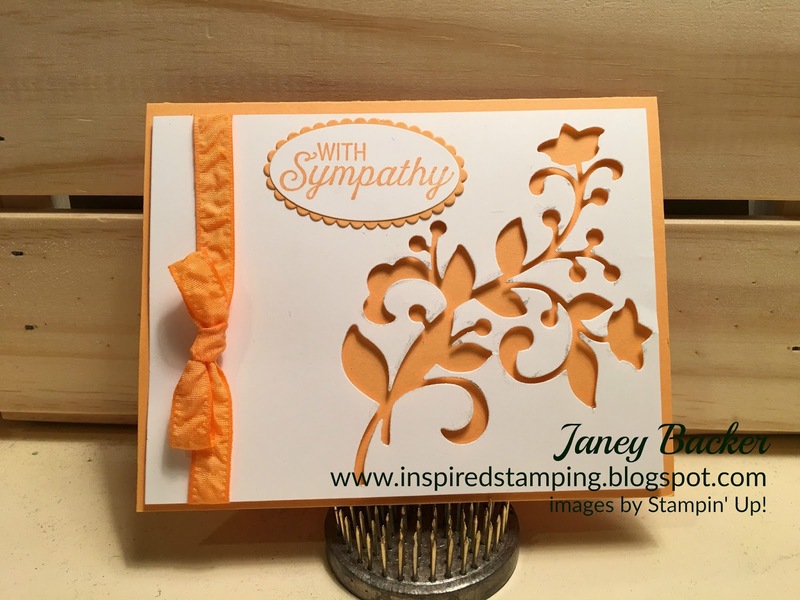 It is a super fun event with projects that we make, demonstrations of techniques and ideas, laughter, friendship and impressive displays made from Stampin' Up! products. I was so excited to make a display with my favorite, the Flourishing Phrases bundle. I hope you enjoy my display and how I share each project. If you like this post, then please subscribe to my blog in the right hand column. This is my display at the event. This Glassine Gift Bag is embossed and the belly band is bedecked with ribbon, flowers, leaves and sentiment. I wanted it to look very special to tell the recipient they are very special! 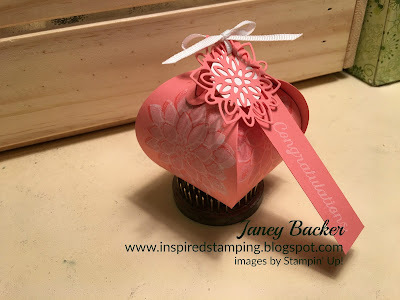 The Curvy Keepsake box is perfectly sized to stamp the large flower. 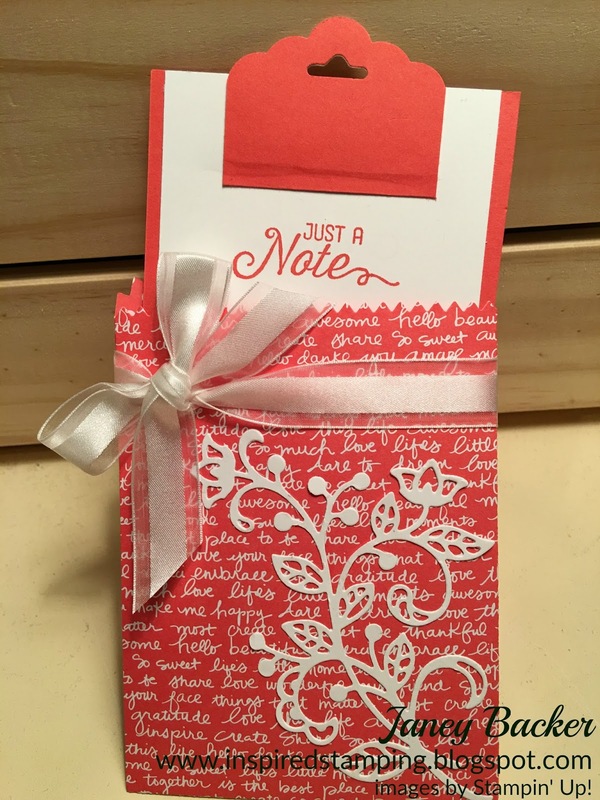 This is Watermelon Wonder ink stamped on Watermelon Wonder card stock. 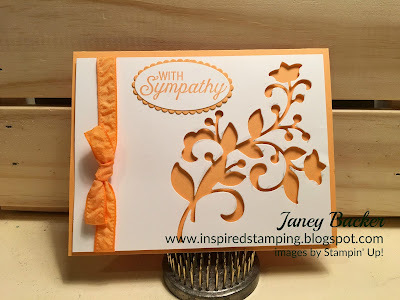 Then I stamped our Whisper White craft ink over the same image. I love this effect! 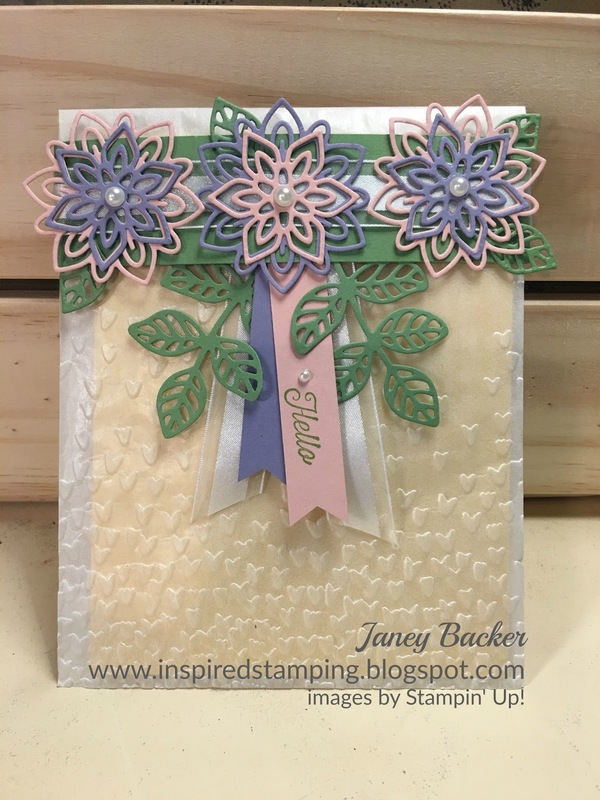 I love the die cut flower flourish but I also really like the negative from the die cut. The cut-out absence seemed fitting in this sympathy card. I traced the entire image with clear glitter Wink of Stella to make it sparkly and pop. The flourish stamp makes a soothing background on this wedding card. I wanted it to be pretty but not pink and girly. The Soft Saffron and Mint Macaron are a delightful color combination. 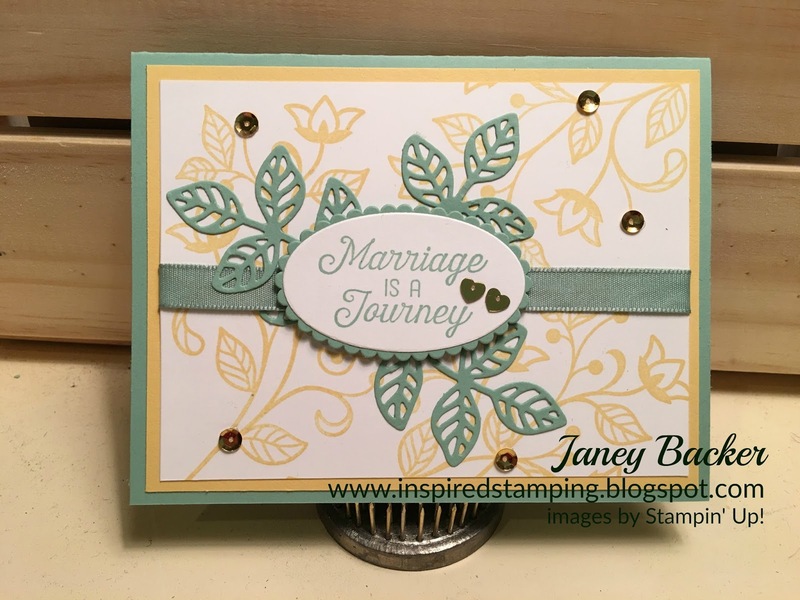 The die cuts in this bundle have so much versatility. The border has a very interesting design. 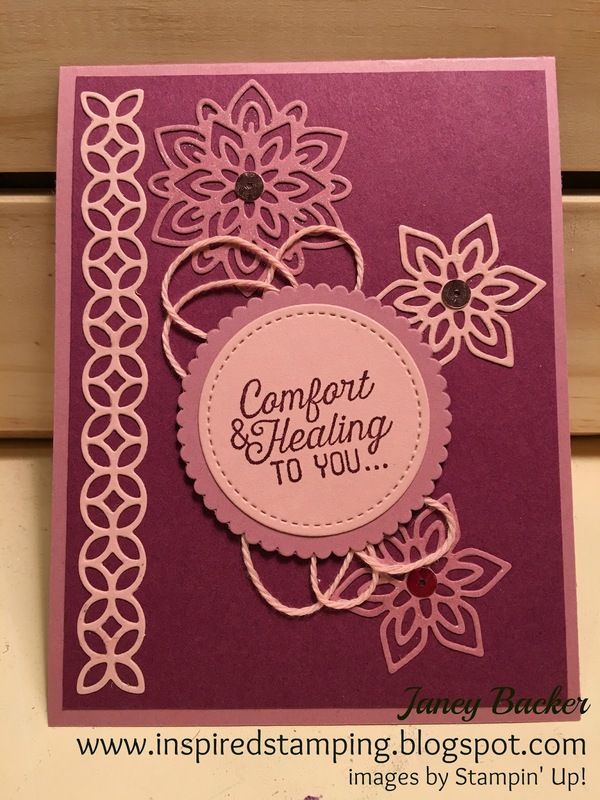 This is cheerful get well card in Sweet Sugarplum, Rich Razzleberry, and Blushing Bride. The clear Wink of Stella made the flowers subtly elegant. One more packaging idea, this is the Mini Treat Bag thinlit. The flourish is a sophisticated detail on the bag. 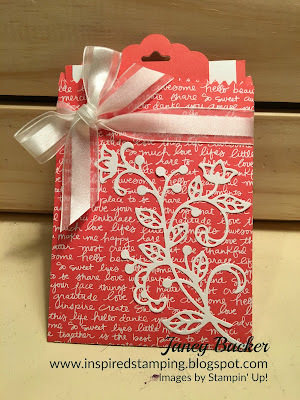 I used our scalloped tag topper punch to create a tab to pull the note card out of the bag. There was also room for placing 3 Ghiradelli chocolate squares to make this truly a treat bag! 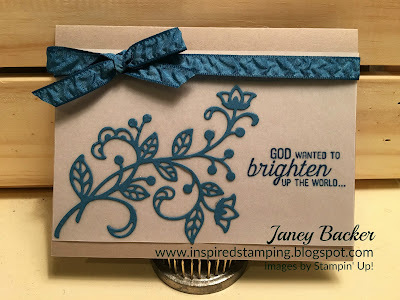 This card front is a sheet of vellum stamped with Dapper Denim and the die cut flourish attached with fine tip glue. I hope you have enjoyed my projects for this display. I really enjoyed making them. Which project would you like to make? If you want to add this bundle to your collection you can get it here. 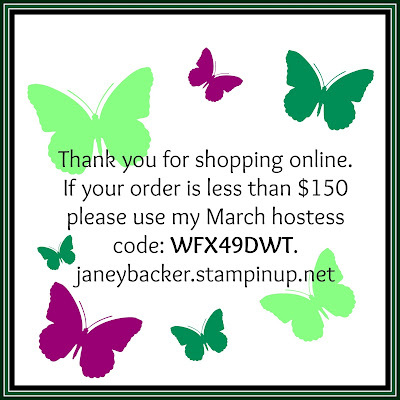 You can shop online here or contact me for assistance. Thank you for coming to visit my blog, I appreciate your friendship and comments! Labels: cards, display, floral, flourishing phrases, handmade cards, iiotr, Inking Idaho in the road, packaging, Stampin' Up!